The event calendar will show you all scheduled public events. If you are interested in booking a show, you can contact us by clicking HERE. 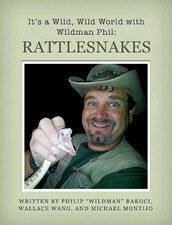 Wildman Phil offers a variety of trips and excursions throughout Arizona. From night time nocturnal excursions to Grand Canyon hiking trips, you are sure to find something that you like! Wildman Phil offers a variety of entertaining and educational performances for festivals, fairs, RV parks, schools, corporate events/team building, and private parties. Follow the Education and Entertainment link to learn more.